Note: A version of this Q&A appeared earlier this week in “LA At Home,” the Los Angeles Times’ daily home and garden blog. 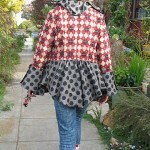 Mary Ann caught one glimpse of the awesome coat and matching socks . . . and said - Hey, that's Keeyla Meadows! 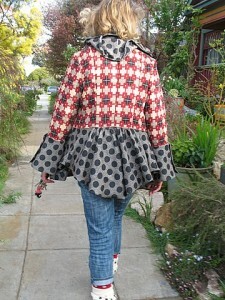 Los Angeles native Keeyla Meadows lives in Berkeley where she makes art and designs gardens. 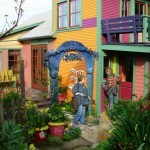 Her cheerful, 50-by-100 foot city lot is a living canvas packed with life-sized female figures and not-so-perfect vessels, hand-built in clay and glazed in a palette of turquoise, apricot and lavender. No surface here is left unadorned. 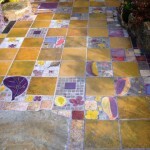 Whether it’s her swirly ceramic paving, custom metal benches or sculpted walls, Keeyla artistically places favorite objects and plants with a carefree confidence that few of us can master. 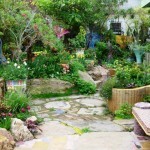 Fans of Keeyla have long admired her award-winning gardens, including a ‘Best in Show’ at the San Francisco Flower & Garden Show a few years back. 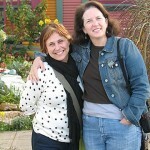 Her beautiful first book, Making Gardens a Work of Art, was published in 2004 by Sasquatch Books, a Seattle imprint that also published my first book, The Northwest Gardener’s Resource Directory. 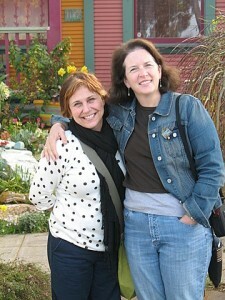 In 2008, I lucked into an impromptu visit to Keeyla’s personal wonderland when my girlfriend Mary Ann Newcomer boldly followed her into Café Fanny’s in Berkeley, an Alice Waters bistro, and snagged an invite for our group of breakfasting garden writers. 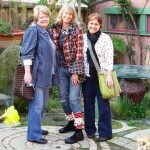 Lorene Edwards Forkner, Mary Ann and I hopped in the car and followed Keeyla to her bungalow, a few blocks away. It is fair to say we were hyperventilating! “You can take photos, but don’t publish them until my book is out,” Keeyla requested. It was the least we could do, having feasted our eyes on her botanical paint box, imagining how we might try her playful ideas in our own backyards. 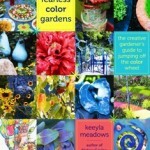 Her new book, Fearless Color Gardens: The creative gardener’s guide to jumping off the color wheel (Timber Press, $27.95), has just been published. 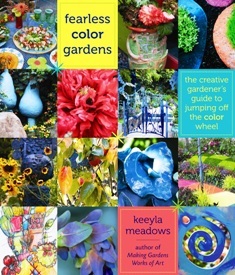 Filled with Keeyla’s photography of design projects, as well as her doodles and sketches, it reads like a colorist’s memoir, complete with a muse named Emerald. 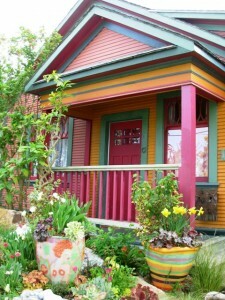 Strong on fantasy, it’s also a useful workbook for garden owners who need a nudge toward the more vibrant end of the color spectrum. I recently asked Keeyla about the book. 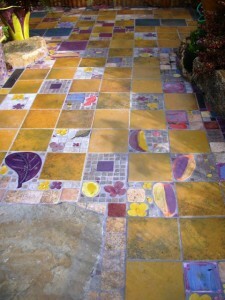 Q: How do you teach students to feel confident as garden designers? A: A lot of people have this mantra that says, “I’m not a creative person. I’m not an artist.” Our lives are built around the practicality of what we have to do everyday so many people shut those doors to creativity a long time ago. 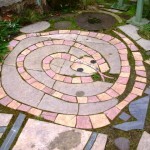 I suggest you treat garden design like something you do all the time. The physical activity of placing plants in a space can be as easy as folding laundry and putting it away, or setting the table, or baking a cake. Q. 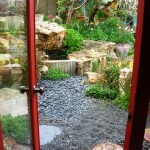 How can I make a landscape project feel less overwhelming? A. I suggest you divide your space up like a series of photographs or like windows. Decide what “picture” you’re working with, where it starts and ends. 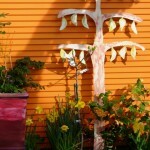 Start with looking out the kitchen window and use plants and art to fill the frame. A. 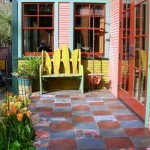 A lot of my color sense comes from growing up in Los Angeles and living with its “colorfulness” – the light, tile work and Catalina Island all inspired me. 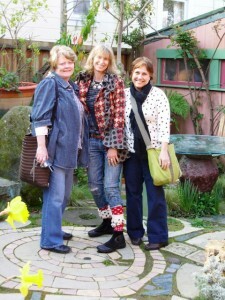 Right now, I’m designing a new garden for the San Francisco Flower & Garden Show in March. 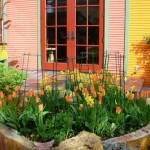 It’s a habitat garden and the colors I’m using come from the red-headed garter snake, an endangered snake from the San Mateo coastline. It has a read head with a turquoise and red stripe down the back, so it’s providing my design motif, my imagery and my color combination. Q. 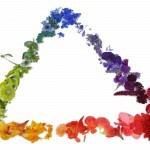 How do you suggest people “jump off” the color wheel? A. The traditional color wheel makes my head spin. I use a color triangle, which is so stabilizing. I put blue at the top of the pyramid – it represents the sky. The other two points are red and yellow. Between the three primary colors are the secondary colors. 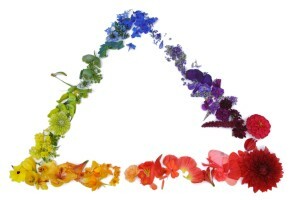 On either side of any point is a harmonic chord of color. You’ll never go wrong if you take one of the points – red, yellow or blue – and use one of those chords of color on either side of it. Q. 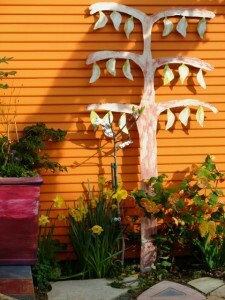 How do you balance artwork with the plants in your garden? A. Art gives me a constant relationship to plant against, a very stable feature to move through the seasons with. Art creates so much focus and orients the whole space so one is not always reinventing. It is like a stage setting. 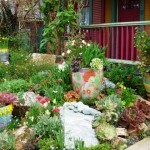 The artwork and hardscape set the stage for your plants to really become the stars. 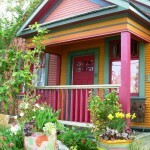 Wonderful and whimsical colors! Who else has the guts to live with this much of the rainbow? 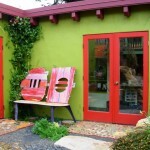 This entry was posted on Sunday, December 20th, 2009 at 12:00 am	and is filed under Book reviews, Creativity, Furniture design, Gardening, General, Landscape Design, Plants, Playfulness, Sheds & Havens, Writing. You can follow any responses to this entry through the RSS 2.0 feed. You can leave a response, or trackback from your own site. Really it is look like heaven & I like to read these post very much & one more thing that is I have download all these images & set as my desktop. Very nice pictures are there & please keep sharing such a very nice posts. 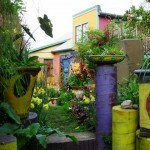 Keeyla’s garden doesn’t just smile- it is a full throated laugh. How wonderful! if you are ever taking applications for a new best friend….. ha! you ladies sure have fun! All that yummy color lifts my heart. Thanks. 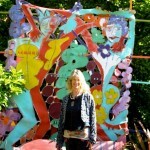 .-= Dee/reddirtramblings´s last blog ..Once in a blue moon . . . =-. it is absolutely ridiculous how much i love this!! i thought my garden was colorful, but this makes mine look like chiaroscuro. well done! I enlarged every photo…such a vibrant and happy place!!! Love it. .-= Darla´s last blog ..Header Challenge…. "Mushrooms/Fungi" =-. Hi! Do you have any contact information on Keeyla Meadows? I am having difficulty finding any, in order to possibly visit her garden. Thanks for any help. This aesthetic is exactly what I would love to have in my own garden. Thanks for sharing such inspiring photos!